Designed for easy nesting, saving valuable space. Built with steel oval tubing and gusset plates for extra durability. Custom logos available on cart handles and baskets. 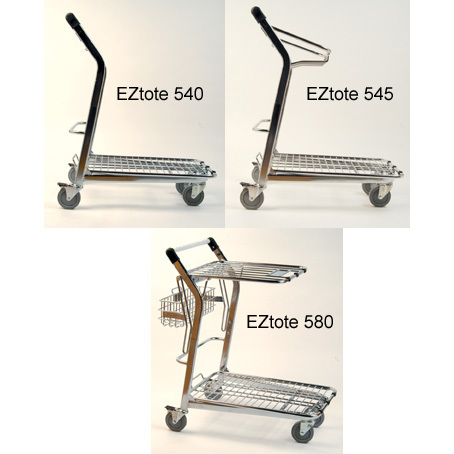 These versatile multi-purpose carts roll on 5" heavy-duty non-marking wheels with steel roller bearings. Includes rear brakes. Available in Dark Gray finish. Ships UPS, except H101-545. FOB Shipping Point. Measures 19"W x 5.5"D x 6"H. Black VersaCoat finish. L x W x H Upper Load Area Lower Load Area Wt. (lbs.) Price Ea.